The Central Coast Chorale invites the Lincoln County community to its final concert series of the 2018 season. 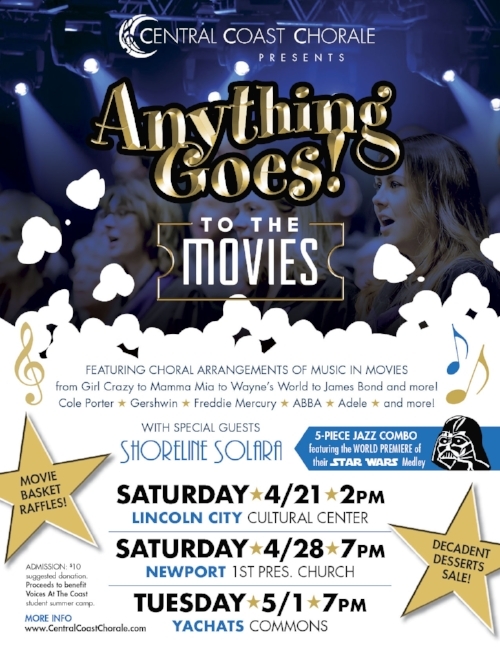 The spring “Anything Goes” concert always focuses on a lighthearted theme and this year the chorale has chosen great music from some wonderful movies.—from Girl Crazy to Mamma Mia to Wayne’s World to James Bond and more—composed by Cole Porter, George Gershwin, Freddie Mercury, ABBA, Adele, and more! From the soulful sounds of Down in the River from O, Brother Where Art Thou to a rousing men’s chorus of Luck Be A Lady from Guys and Dolls, you’ll hear some of the best of Hollywood. With special guests SHORELINE SOLARA, a 5-piece jazz Combo who will be performing the world premiere of their Star Wars medley, arranged by Forrest Fisher. Anyone who attended the Chorale’s Mardi Gras concert in 2017 will recall a show stopping performance of Forrest’s arrangement that evening. After the concert the Chorale will be hosting a sale of decadent desserts and a raffle of movie-themed baskets. Proceeds from these sales will go to the choir’s newest project, a summer singing camp for high school students that will take place this July. By establishing “Voices at the Coast” the Central Coast Chorale plans to make sure that young people in our area have access to musical education and the joys of ensemble singing. Movie basket raffles, decadent desserts, and some of your favorite tunes from popular movies. Admission of $10 suggested donation. Proceeds to benefit the new Voices at the Coast teen (students in grades 8-12) summer camp this July 12-14, 2018, at Oregon Coast Community College.